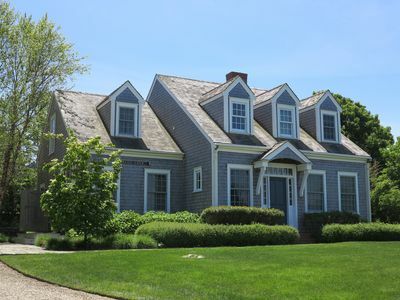 This beautiful family home, with 6 bedrooms and a 20'x40' pool, is a new and extraordinary addition to the Nantucket rental market. 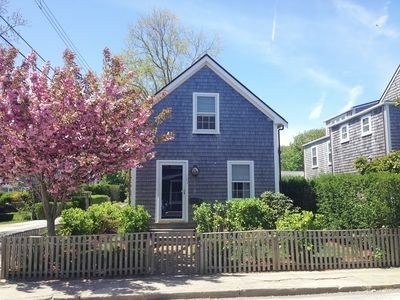 Located on a large, very private lot on exclusive Cliff Road and adjacent to the Westmoor Club and acres of conservation land, this home makes for the ultimate vacation retreat with its easy access by foot or bike to to town and North shore beaches and the peace and quiet of your own private enclave. 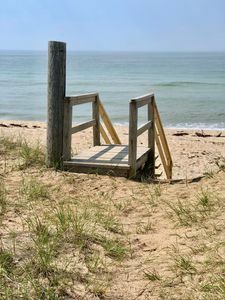 Fully renovated in 2007, the house is designed in "upside down" fashion to take advantage of lovely natural light, open views of Tuppancy Links and conservation land and distant water views, as well as the wonderful breezes off Nantucket Sound (about 1/4 mile away). When the breezes aren't blowing, step into the fully air conditioned comfort of our home. 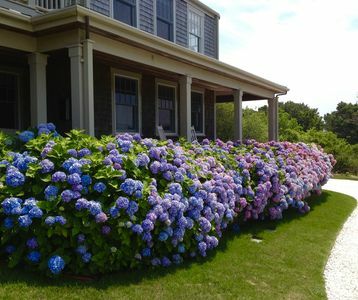 The property abounds with hydrangeas, roses and other native Nantucket flora and fauna and offers many spots to sit and enjoy the natural surroundings, on one of the many decks, by the pool or near the gardens. The open concept floor plan on the second floor of the home is perfectly designed for all your family entertaining needs. 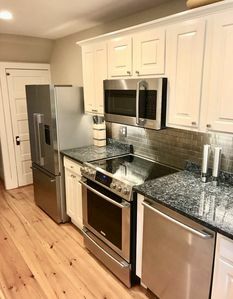 The fully equipped kitchen, which includes top of the line stainless steel appliances, sports a 14' granite topped island that seats 8 and is the center of the action. The main living area has a large flat screen TV with stylish, but comfortable, seating and a separate round table sitting area for cards, puzzles, etc. The adjacent dining area can seat up to 12. On the upper deck, just outside, you will find an additional teak dining table that also accommodates a large group. 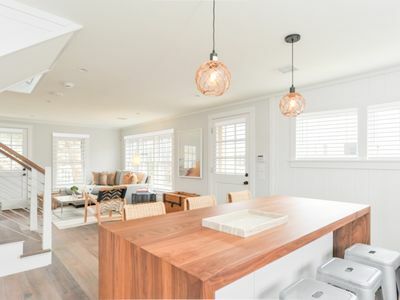 In addition to the spacious common areas, the second story offers a Library and a loft space directly above the kitchen for individuals or smaller groups to to read, play games or watch television. A powder room is located on this floor as well. The master suite rounds out the second level with a four poster king bed, a comfortable reading area for two, a flat screen television and a full bath and walk-in closet en suite. 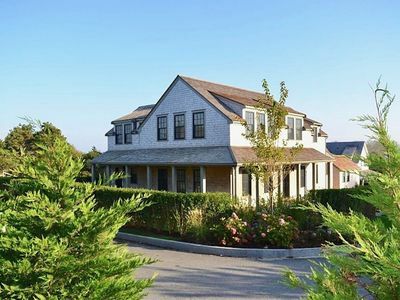 The master bedroom has west- and south-facing windows for light and breezes, as well as its own entrance to the large upper deck that overlooks the rolling green lawn and expansive conservation land. 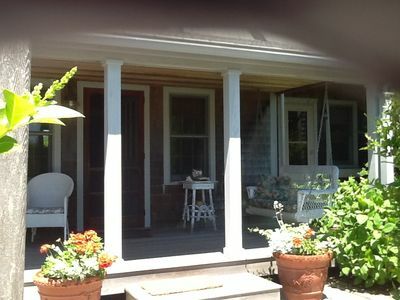 Here, you can enjoy an early morning coffee or quiet glass of wine. 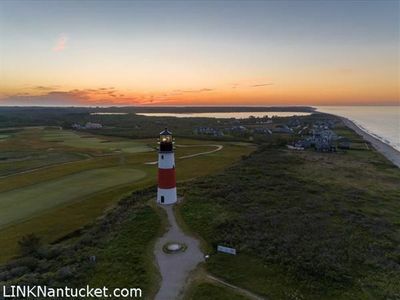 Sunsets from this venue are spectacular and star-gazing on Nantucket can't be beat! 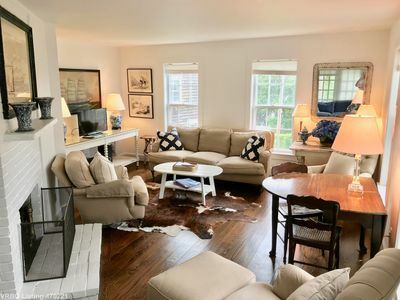 The ground floor of this home offers a second smaller living room with two couches and television, great for a kids hangout space. 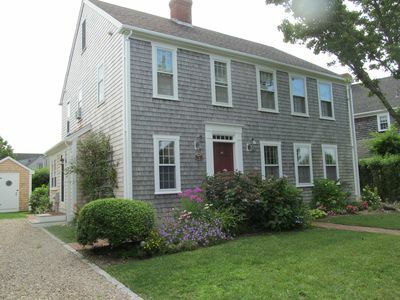 Four additional bedrooms and a second full Master suite are also located on this floor. The four traditional bedrooms include three freshly decorated rooms with two twin beds in each and one room that has offers a queen sized bed. 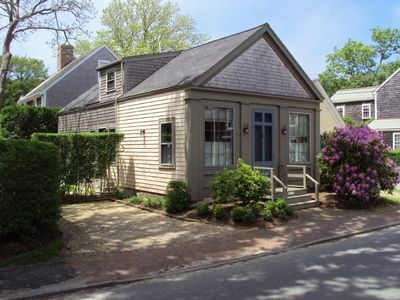 These bedrooms share two new bathrooms, both with double sinks. 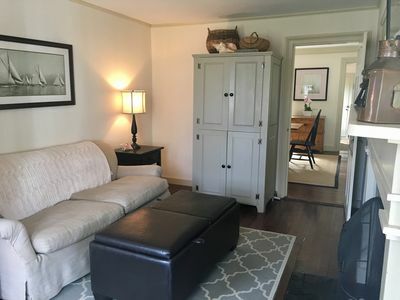 The second Master suite has its own entrance, a separate bedroom (queen), a private living room and full bath with double sinks and walk in closet. All linens are new. 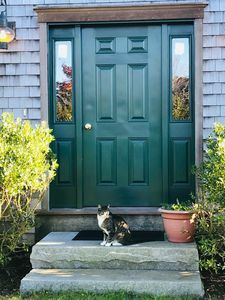 The home's first floor mudroom, which includes a full sink and a second washer and dryer, provides convenient access to the private outdoor shower and separate entrance to the pool and comfortable outdoor living areas. The house is wrapped, on the first level, by deep decks and multiple seating and entertaining areas. 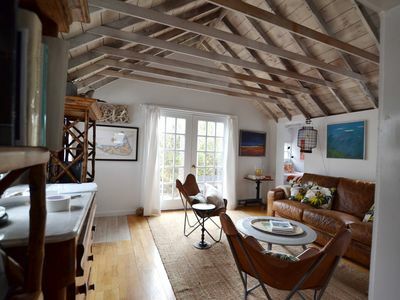 The second floor offers an oversized upper deck with seating for 12, a deep seating area for two and a gas grill. The 20'x40' pool is surrounded by mahogany decking and lush privet and has multiple lounging areas. The large, lush lawn is the perfect venue for games of croquet, frisbee and badminton. 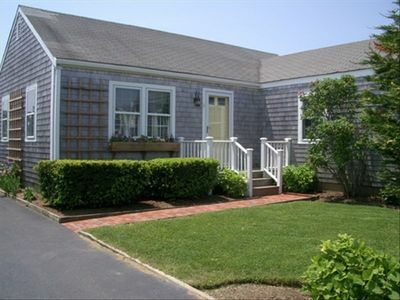 In addition, our home is fully equipped with all manner of beach towels, toys and boogie boards. A full ping pong table is available for outside play as well. 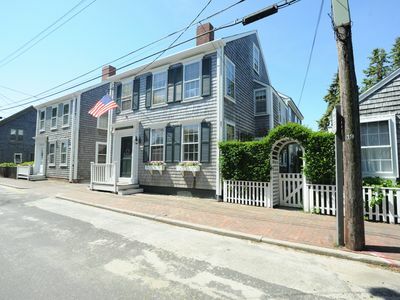 "Vitamin Sea" - Beautiful cottage in downtown Nantucket with off-street parking! NEW CONSTRUCTION! 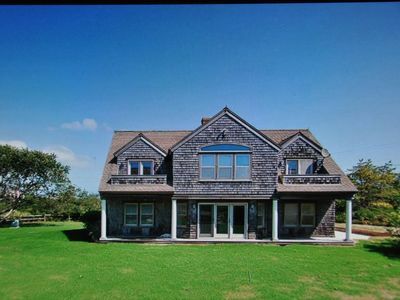 4550+ SQ FT HOME, HEATED POOL. Quiet street, walk to town! 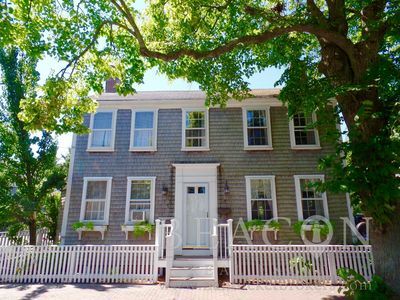 Walk To Town From Beautiful Historic District Townhouse! !